This week's WYB feature takes a look at budget electric showers and what you can expect from £150. Can you buy electric showers under £150? Posted By Alan, 18th Apr 2017. 3 Minute Read. There’s nothing better than pressing a single button and having almost instant, temperature controlled water at your service. Have you ever had the ‘pleasure’ of trying to mix both hot and cold water taps to get the perfect temperature first thing in the morning or last thing at night? It can have you feeling like an 80’s Disc Jockey mixing records. It’ll therefore come as no surprise that electric showers are one of the most popular products in a modern bathroom. In this week’s ‘What’s Your Budget’ feature we shower you with 5 fantastic electric showers under £150. What’s your budget for an electric shower? Can you buy an electric shower for less than £150? WYB finds out! 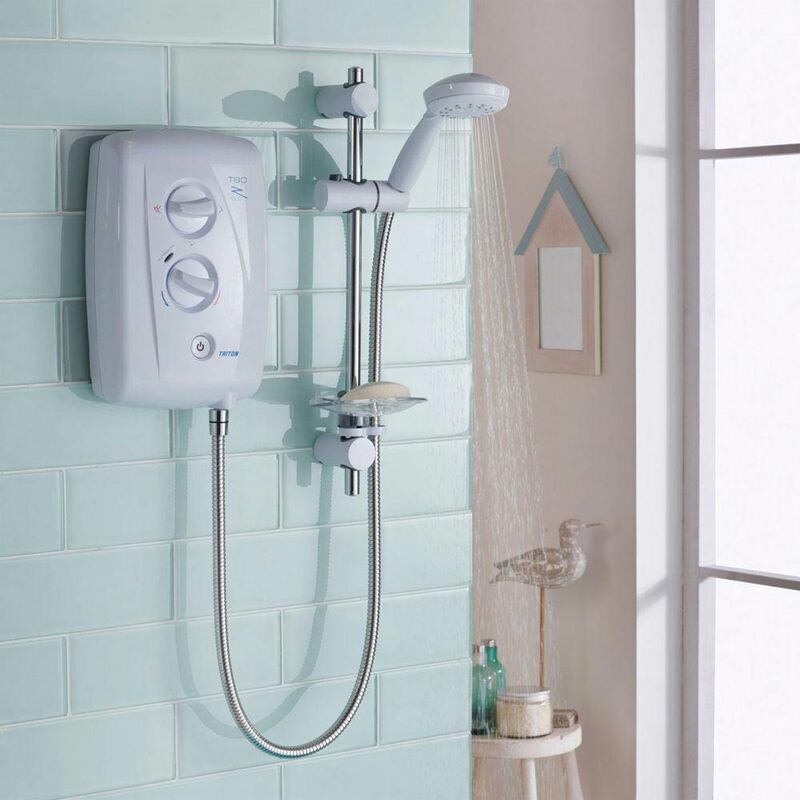 An electric shower is usually fixed to the wall and connects to both the mains electricity and plumbing. It is commonly found as a plastic box, containing the inner workings including a heating element, and a separate slider rail kit which holds the the shower head and is typically adjustable. The two items are connected via the shower hose which carries water from the box to the shower head. 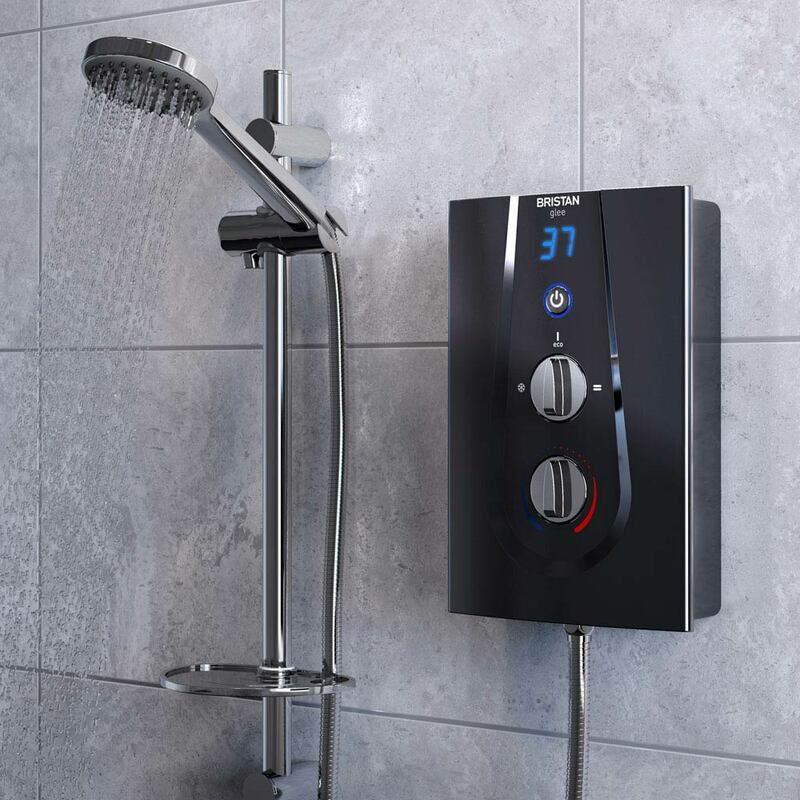 Thermostatic controls (temperature controls) are found on the shower box, which allow you to choose your desired water temperature, along with a power button and other features which may vary between models. The shower head may also have functions too including massaging features and a variety of sprays. When you’re choosing an electric shower on a budget it’s important to look at the features which are most important to you. You may find that an all singing all dancing model might just creep over budget, but are you really going to use all those features? Design can also affect price with some of the brushed steel designs like this Triton Aspirante costing considerably more than their white counterparts in general. The final thing to mention is brand. Just like with anything really, brand names can have a big impact on cost so it’s worth considering a brand which offers the best value. Are there electric showers within a £150 budget? There’s loads of electric showers under £150 which means you’ll be able to really shop around when it comes to buying yours. To give you a head start (see what we did there) we’ve listed 5 exceptional budget electric showers for you to look at. We’ve considered price, style and functionality to give you the best electric showers to consider for less than £150. As always this list is in no particular order and please not that we've listed all the 8.5kW options here although there are many other kW ratings available. Let’s get started! The Bristan Bliss electric shower oozes both style and quality. Finished in a smooth white finish it features touch control and temperature control making it easy to use and a doddle to clean. It comes in a range of kW power ratings including 8.5kW, 9.5kW and 10.5kW and features an eco power setting, anti-scald protection and is easy to install making it hugely popular. What could you buy with the change? This electric shower from Bristan costs less than £140 which means you could buy some fancy soaps and shampoos to enjoy your luxury new shower experience. The Grohe New Tempesta pressure stabilized electric shower gives you an exceptional brand within an affordable price range. The compact unit and large shower head offer both style and practicality. Grohe have thought of everything with the 3 spray options including rain and jet which provide comfort or power whilst Twistfree technology prevents the shower hose from twisting which can be so annoying at times. This item is also protected by a rubber shockers on both box and head to make them shockproof to limit damage should they ever fall. What could you buy with the change? Anybody who knows the name Grohe would have probably thought they wouldn’t find an electric shower in this price range. You might not be able to buy anything with 5 pence these days but you’ll be more than happy to a proud owner of a Grohe electric shower. The cool and clever AquaFlex electric shower from Electrolux might not cost the earth but that certainly doesn’t mean that it isn’t packed with fantastic functionality. It comes with an integrated storage shelf, water filter, temperature display and is easy to install. It also features an Anti-limescale shower head which make cleaning easy peasy. What could you buy with the change? Electric showers under £100 don’t often have the quality, functionality or style that this one has and the Electrolux Aquaflex comes in around £90 under budget. This is enough money to put towards a new shower panels to help show off your new shower in style. The sleek, black finish of the Bristan Glee electric shower creates a sense of style and sophistication. It’s fresh, compact look is perfect for monochrome bathrooms or any modern setting. Ideal for settings without stored hot water, it draws water directly from the mains which makes it easy to fit anywhere. It features useful functions including phased shutdown, easy clean and warm-up mode which alerts you once the water is at the user’s desired temperature. What could you buy with the change? This electric shower comes in well under £150 leaving you with enough money to put towards a new heated towel rail for when you’ve finished relaxing in your new shower! The Triton T80Z Fast-Fit Eco electric shower not only looks fantastic, but it has excellent water efficiency and offers premium performance. Its rub clean shower head is simple to clean to. 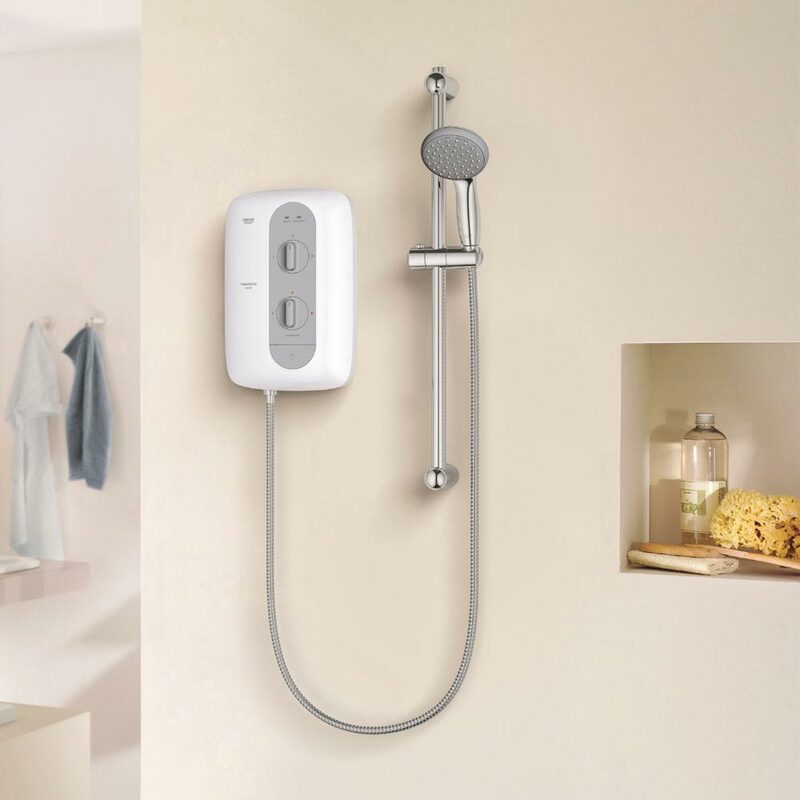 It has tons of easy to fit features; making it perfect for replacing old electric showers and the multifunction handset provides 5 spray settings for the ultimate shower experience. What could you buy with the change? Triton is an excellent shower brand which means grabbing a Triton electric shower under £150 is a really great buy. It doesn’t offer a lot of change but you’ll certainly have an exceptional budget electric shower for your money. What will your electric shower budget do for you? A budget electric shower for less than £150 would lead you to believe that you’re getting lower quality, less functionality and unknown brands, but this simply isn’t true. 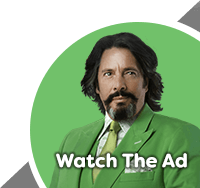 As we’ve shown in the examples above, you can get some excellent brands with exceptional performance without having to spend huge amounts of money. This WYB article has chosen electric showers for your £150 budget but hasn’t factored in the cost of additional accessories. The good news is that electric showers usually come complete and don’t require anything else for them to work as intended. The electric showers shown are 8.5kW options but we offer various kW options in most products. We hope you enjoyed this week’s WYB feature and find it useful when you’re looking for an electric shower on a budget. If you have any suggestions, feedback or questions please leave a comment in the comments section below. If you know a friend who may benefit from this feature please feel free to share it with them via email or social media.